The Nissan 370z truly is an amazing car. It’s nibble, fast, and also extremely reliable, as you would expect from a Japanese car. It truly is a pleasure to drive, and the fact that parts for it are so readily available means that you don’t always need to go down the expensive dealership route in order to get high quality parts. Instead, you can opt to purchase these for yourself and either install them on your own, or have a friend to help you. Regardless, be sure that you have the proper lifting equipment for this. There are actually quite a few (as you’d expect) brands available that can supply you with not only brake rotors, but also the pads as well. As a general rule of thumb, if you are replacing the rotors, then it is advisable that you change the pads as well. However, you do not necessarily have to change the rotors if your pads are running low. There is the argument though that if you’ve went to the trouble of removing the wheels and you’re already in the brake mechanism that you may as well. When it comes to selecting performance rotors and brakes, it’s important that you look into the reviews fully to make sure that they do provide what you’re needing. Our first pick comes from R1 Concepts as part of their Eline range. This is a four pack of slotted rotors and also discs. These slots provide two main goals; to act as a wear indicator so you know how much friction material is left, as well as to aid in the pads gripping onto the discs. It can also aide in reducing the overall temperature of the breaks which will build up quite quickly when put under use. As a bonus, the entirety of the rotors are covered in Zinc. The significance of this is that it will help to minimise the overall corrosion that will undoubtedly take place over time. Since it comes in a 4 pack, you don’t need to worry about buying any other parts for this setup, especially since your current brake callipers will still work with these pads and rotors. At less than the price of a PS4 Pro, you’re getting amazing performance at a modest price point and are highly recommended! If however you have a bit more money to spend, and you are wanting to ultimate performance out of your brakes, then it is recommended that you opt for a drilled rotor setup. The benefit of drilled rotors is that they can greatly up the ante when it comes to heat dissipation. This in turn results in great overall performance and superior braking. If you are going to be doing any kind of racing with your car, these are definitely the rotors to pick from. The downside of this setup though is that they are more expensive. Since they have been drilled, they need to be stronger overall so that they don’t crumple under the weight of the car. The end result of this is that it means that this reinforcement results in more materials being needed for the rotors, and therefore this increases the price. Hands down, just now the best slotted and drilled rotors for the 370z are from EBC. They come in slightly different varieties for the front and back axles, and it is important that you choose the correct ones since ones for the front will not fit on the back and vice versa. Unlike the R1 Concepts variety, these do not come in a 4 pack for the reason that since they are a bit more expensive, to save the consumer money they are not lumping them all together since it may be the case that you don’t need a full new set. In terms of the reviews, they are excellent. The only exception to this is a poor review from someone that failed to prepare and mount the rotors properly, but that is user error and not error on the part of the rotors. The overall consensus of these is that they last for a long time, and are extremely quiet too. Not only that, but the overall performance of them is second to none, so basically what you’re looking for when it comes to brakes. 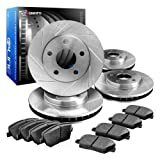 When it comes to pads to bite onto these rotors, you will also need specific ones for the front and back of the car. Thankfully, EBC also produce excellent performance brake pads dubbed ‘Redstuff’. These are ceramic brakes which produces a lot less brake dust than other manufacturers once they have ‘bedded in’. The people that have bought these are extremely happy with them and many are commenting on how well these bite onto the rotors, which is essential, especially when it comes to racing your 370z. You are also much less likely to experience any breaking inconsistencies when using these pads and rotors together, more commonly known as brake fade. Basically, when this happens, it means that you do end up losing stopping power due to the sheer heat build up when it comes to stopping your car. When it comes to EBC, this is not an issue. Regardless if you only need the front, or back, the quality of these is second to none and they excel in all types of weather.